from its four cannons was often sufficient to shoot down the enemy. Before the advent of the Second World War, the twin-engine fighter had received little attention in most countries, because fighters were primarily envisaged as day interceptors. This task could be fulfilled most effectively by single-engined fighters and little effort was placed behind the development of long-range, heavy combat aircraft. The exception was Germany where the long-range strategic fighter received close attention from the mid-thirties, resulting in the Messerschmitt Bf 110. Britain's lack of long-range heavy fighters, when the war started was a source of humiliation for the RAF single-engined fighters, since the Hurricane and Spitfire lacked the endurance for effective standing patrols. It was soon discovered that a heavy long-range fighter would be invaluable to perform a wide variety of tasks. The result was the Bristol Beaufighter, which entered service a year after the outbreak of war at a time when it was most sorely needed. Built as a company-funded long-range fighter (using major components from the earlier Beaufort torpedo-bomber), the Beaufighter prototype first flew on July 17, 1939 under the command of Captain Uwins. This was little more than eight months after the initial design had been approved, and two weeks before the first airplane even flew, a production order for 300 aircraft under specification F. 17/39 was granted. This seemingly desperate measure by the Air Ministry was, by 1938 to 1939, not uncommon, as it helped speed up the production of much-needed combat planes. When No 29 Squadron of the Royal Air Force became fully operational with the Beaufighter Mk IF in October 1940, it marked the beginning of operations by a night fighter that was completely capable of performing its task. For although the Bristol Blenheim IF, also equipped with the new (AI) airborne interception radar, was operational, the Beaufighter had two qualities which the other lacked—speed and firepower. Once a Beaufighter had detected a German Bf 110 night bomber, a single short burst from its four 20-mm. cannons was often sufficient to shoot down the enemy. The fact that a heavy twin-engined fighter such as the Beaufighter was available as soon as the late autumn of 1940 was largely due to the foresight and enterprise of the Bristol Aeroplane Company in envisaging the probable need for a high-performance long-range fighter capable of undertaking duties of a more aggressive nature than those foreseen by official specifications. At the end of 1938, L. G. Frise and his design team began the design of what was virtually a fighter variant of the Beaufort general reconnaissance and torpedo-bomber. The initial proposal was framed, as far as possible, to meet the requirements of specification F.11/37, and envisaged an aeroplane using a large proportion of Beaufort components, including the wings, tail assembly and undercarriage, a pair of Hercules radial engines and carrying a battery of four 20-mm. Hispano cannon. The economy of the proposal was of obvious appeal to the government, struggling to meet the vast requirements of a major rearmament program, and, as the Type 156, four prototypes were ordered. To the Japanese, the Beaufighter became known as "The Whispering Death" because of the speed at which one could suddenly strike and turn for home. The Beaufighter prototype (R2052) had two-speed supercharged Bristol Hercules radials which were mounted well ahead of the wing leading edges to alleviate vibration. This necessitated cutting down on other weight forward of the c.g. and resulted in the Beaufighter's characteristic stunted fuselage nose. The main fuselage and the engine mountings were, in fact, the only entirely new components. The outer wings, including the ailerons, flaps and tanks; the whole of the retractable landing gear and hydraulic systems; and the aft section of the fuselage, complete with tailplane, elevators, fin, rudder and tail wheel, were identical to those of the Beaufort, while the center section, with tanks and flaps, was similar apart from certain fittings. Official trials commenced at an all-up weight of 16,000 lb. after the first prototype's delivery to the RAF on April 2, 1940, and a maximum speed of 335 mph was attained at 16,800 feet. As production continued, additional versions appeared differing in engines installed and in other ways. Beaufighters were used in many theaters of war and for varied duties, performing particularly well in the Western Desert thanks to their long range. Coastal Command of the RAF received several torpedo-carrying versions which were responsible for sinking a great deal of enemy shipping. The last and most numerous was the superb Mk X, which could carry a large torpedo or bombs and rocket projectiles, and claimed among its victories several German submarines. The Beaufighter IF was soon bearing the brunt of the action against German night bombers, weighing up to 20,800 lb., it attained a maximum speed of 323 mph at 15,000 feet, had a range of 1,500 miles at 194 mph, an initial climb rate of 1,850 ft./min., and a service ceiling of 28,900 feet. Although the Beaufighter IF handled well, it was tricky under certain conditions. There was a strong tendency to swing on takeoff and the danger of a roll-over in the event of an engine cutting suddenly. On landing, the Beaufighter's large flap area pulled the aircraft up rapidly, but there was a tendency to veer from the straight which, if unchecked, resulted in a ground loop, the c.g. being so far aft. The first few Beaufighter Is were delivered without the wing-mounted machine-guns, and initially it was found that when the cannon were fired, the recoil caused the nose to dip enough for the pilot to lose his target. The seriousness of this fault was such that thought was given to alternative armament and, with one pair of cannon and the wing-mounted machine-guns supplanted by a Boulton Paul turret containing four 0.303 machine guns and mounted just aft of the pilot's cockpit, the Beaufighter V was produced. Only two examples (R2274 and R2306) were completed, both being converted Merlin engined Mark IIs, and these were used experimentally by No. 29 Squadron during the early months of 1942, but the installation of the turret drastically reduced performance, and the Beaufighter V was abandoned. 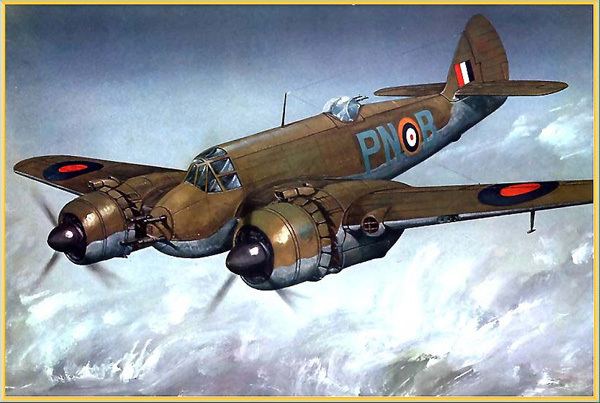 The Beaufighter had two qualities which the Bristol Blenheim lacked -- speed and firepower. The Beaufighter T.F.X was the final major production variant and passed through several important modification stages without any change in its Mark number. These included, in particular, the introduction of A.I.Mk.VIII radar in a "thimble" nose—this radar having been found suitable for ASV use—and a large dorsal fin (after a trial installation on a Beaufighter 11, T3032) to give the required directional stability and linked with an increase in elevator area to improve longitudinal stability. Before deliveries of the Beaufighter X could begin, a batch of sixty Beaufighter VIs with Hercules XVI engines and provision for torpedo-carrying was built. These were designated Beaufighter VI (I.T.F. )—interim torpedo fighter—and were converted to Mark Xs when more Hercules XVII engines became available. To the Japanese, the Beaufighter became known as "The Whispering Death" (not be confused with "Whistling Death F4U Corsair) which gives some idea of the speed at which one could suddenly appear, strike and turn for home. Beaufighters were also flown by the air forces of Australia, New Zealand and, in small numbers, the US. In Britain they remained flying as target tugs throughout the 1950s. When the last Beaufighter (SR919) left the Bristol Aeroplane Company's Weston-super-Mare works on September 21, 1945, a total of 5,562 aircraft of this type had been produced in the United Kingdom. Of these some 1,063 were Mark Vls and 2,231 were Mark Xs. During its operational career it had played a prime role in defeating the Luftwaffe's night "blitz" of 1940-1941, and it had operated in every major campaign of the war, carrying out the last operational sortie of the European war, a strike against German shipping in the Skagerrak, and serving with distinction in the Pacific until the capitulation of Japan. The Beaufighter may have been the product of improvisation, but it was a remarkably successful one. Shown above is a 3-view of the Beaufighter I with experimental A.I.Mk.VIII radar "thimble" nose. 305 mph (490 km/h) @ sea-level. 1,400 miles (2,253 km) with torpedo and normal fuel. 1,750 miles (2,816 km) with torpedo and long-range tanks. 1,395 hp (1,040 kW) @ 2,400 rpm at 1,500 ft. (457 m). Four 20 mm Hispano cannon in the fuselage nose and six .303 in. machine-guns in the wings and one .303 in. Vickers "K" or Browning gun in the dorsal position. One 18-in. torpedo externally under fuselage. Eight rocket projectiles could be carried as alternative to the wing guns. Created November 27, 2001. Updated January 6, 2013.